A light daily moisturizer for healthy, toned skin. Quince Day Cream refreshes and protects normal to slightly dry skin while supporting moisture content. Formulation: Quince wax forms a light, breathable protective layer to maintain moisture balance. Quince seed extract with jojoba, apricot and avocado oils firms the skin. Skin Condition: For normal skin. This is very similar to the Melissa day cream, just a little more moisturizing. I used Melissa all summer for my sensitive skin, and now that it's much drier I use this one. It soothes my dry skin but isn't oily or heavy. I tried the Rose Day Cream and its light variety, both of which are wonderful and have their time and place, but the Quince turned out to be the perfect everyday cream for me. Not too heavy, not too light - right in that Goldilocks zone. I use Dr H hair and bath products too, and am never disappointed. Personally, it's been difficult to find a natural line that produces results, which is why I suspect Dr H products are actually made by Elves. Quince Day Cream is so rich and luxurious and my mature,dry skin just loves it. It might be my very favorite product. I really like this product. Not too heavy an keeps skin from feeling dry. I use this face creme when I want a little more moisture than I can get with the Melissa creme. Lovely creme! The day Quince cream is as always wonderful. This was a Mother’s Day gift. 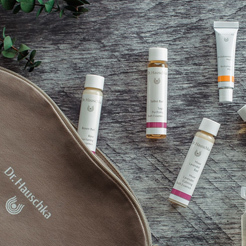 I Love all of Dr. Hauschka’s products. Smooth and easy to apply! This is the best day cream I have tried! It is super smooth and creamy and easy to apply to my face. It leaves my face with a glow and lasts throughout the day. I would recommend this product to anyone who needs hydration to their face. Worked well during the winter months to maintain moisture on dry patches and fine lines. Needed only one application in the morning to last throughout the day. I love the scent and the texture feels substantial but not too heavy or light. I just started using this cream after using my Rose Day Cream all winter and I love how light and smooth it is, while still very moisturizing. I recommend this cream to anyone. My skin likes the variations of the different creams. I use mostly all of them from Dr. Hauschka. From the citrus-like smell, to the texture, I absolutely love this cream. It glides on easily and absorbs quickly. My young daughter loves this cream too. Highly recommend for all ages. I have just started using Quince Day Cream and so far it is working great. It smells great, it gets absorbed very quickly, and my skin feels wonderfully smooth. Great for fall and spring weather protection. I got the quince day cream because my skin was showing reaction of any product I was putting in my skin. I wanted something natural and basic for winters. This is working great! Texture is light. The cream gets absorbed by my skin so easily. The travel size is very handy. This is by-far my favorite moisturizer. I know that everyone praises the Rose Day Cream, but the Quince Day Cream is an underdog. It smells delightful, sort of citrus-y, but doesn't dry out my skin. It also spreads more easily than the thick Rose Day Cream. It makes my face feel fresh and I can smell the scent for the rest of the day. It's great. I've been using this cream for four years or more and it is my go-to day cream. I hardly use anything else (and always Dr. Hauschka). It has a wonderful, lightweight, almost peppery fragrance -- natural and clean smelling. It never feels heavy on my skin. I have received a lot of compliments on how good my skin looks over the years. I trust all of the Dr. Hauschka products and recommend them for everyone. It was a pleasure from the start - this cream glides on and becomes one with the skin in seconds. Great at sealing in moisture for the hectic city life yet and giving the skin an increased circulation - a warm glow. In the summer I use Melissa Day Cream, and it's worked very well. The Quince Day cream seems to be better for the colder weather. It goes on smoothly and has made my skin so soft! It's not as moisturizing as the Rose Day Cream, which I've started using because I was recently prescribed tretinoin topical, which has made my skin more sensitive and drier. This product is a perfect day cream for my face: It is rich enough to provide all-day hydration, but light enough to absorb right away. This is one of my favorite creams! Not only does it smell delicious but I have dry skin in the winter and it is very hard to find a cream that works, but THIS CREAM WORKS!!! I recommend it to everyone. Moisturizes the face in all seasons. I really love the Quince Day cream. It goes on nice, seems to agree with my sensitive skin and has nice coverage. I like a little thicker cream as I am outdoors a lot in the winter and need something substantial. I wish it was a little heavier but I can't complain. We also have wood heat which is drying. It smells heavenly to me. I LOVE this product! I've used it for years and as my skin matures, it still provides just the right amount of moisture. It's light enough to layer over the eye cream and smells great! Good but a little heavy for every day use. I really liked this cream for the first two weeks I used it, but it is a thicker moisturizer. I felt it on my face by 3 in the afternoon and just wanted to wash it off. I prefer the Revitalizing Day Cream. Love the Quince Day Cream! I purchased the Quince Day Cream for the first time and I'm hooked! I love the all day moisture it provides in an early morning pea sized dose. This is my favorite summer moisturizer. It keeps my face hydrated and smells great. I use quince body milk in the summmer as well. Both smell fresh and refreshing. I love this face cream. It doesn't go on greasy or leave my face too shiny like others do. Love the Quince Day Cream! Easy to apply, disappears while making facial skin feel great, smells clean & fresh. My face looks vibrant and fresh all day. I have a normal skin type with a bit of sensitivity, i. e. redness, around the chin. This cream has worked perfectly for me so far and I have been used it from fall to spring. I am not sure if it will work also during summer (if it is too heavy I am going to replace it with Rose day cream light) but so far it is all I need from a cream: hydrating, moisturising just enough - as compared to rose day cream which was too heavy for me - , reduces redness and calms the skin. Just perfect! It's smooth and spreads on perfectly. Smells fresh and herbal. Love it. Back to using one of my favorite day creams! This cream is very light and gives a very soft feeling to the skin without any oily residue. It completely hydrate and soften the skin. 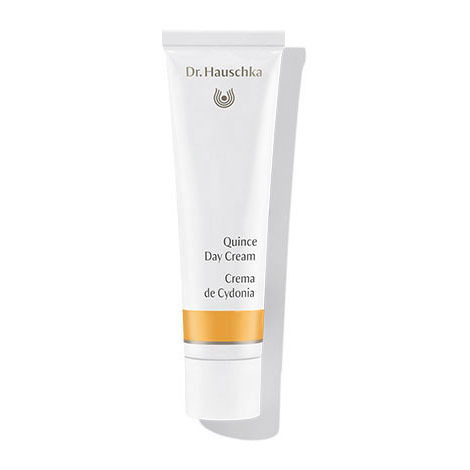 I use Dr Hauschka Quince Day Cream all year round. It moisturizes splendidly, makes the skin velvety-soft, and leaves an earthy invigorating smell. A beauty of a cream. I have been using this cream for 12 years. I live in southern California and the weather can be quite dry. Along with sun and aging this product has helped to moisturize my skin. However, I do mix this product with a bit of Rose Cream then apply to my face. It lasts the entire day. I have always felt like it plumped my skin a bit after applying. I love it!! I have tried to use other products but come back to this over and over again. The Quince cream provides a rich coverage, so it makes sense to use in the winter time as skin usually gets dry. It smells great and feels very emulsifying. I love the Quince Day Cream, Rose Day Cream and most especially the Night Serum. The Quince and Rose Day Creams soften and plump up my skin. They accept make up well too. The Night Serum has a [nurturing] affect plus it tightens mu skim. I've tried to improve a patch of skin that is rough and sore for two years. Even dermatology didn't work, but the Night Serum is solving the problem patch of skin. My woman loves it .Keep up the great quality . Would recommend for a light moisturizing - it's so soothing and clean! Love it! This is an excellent moisturizer! Quince Day Cream is my go-to favorite day cream, even in colder weather. It's got a light feel but leaves my skin well protected--especially after shaving. The scent is light, crisp, non-floral and natural. Recommended as a daily moisturizer for normal to slightly dry skin. Each morning after cleansing and toning, apply evenly to face, neck and décolleté with a gentle pressing motion. In general, a pea-sized amount offers enough product. For maximum benefit, apply while skin is still moist from toner. For deeper, nourishing care, we recommend weekly applications of Revitalizing Mask.